This is what it looks like if one dog isn't allowed on stairs but doesn't like to be alone. so are they in jail because they don't like the stairs? or did you lock them all up to keep them off the stairs? Oh nos, it looks like the smallest one escaped. 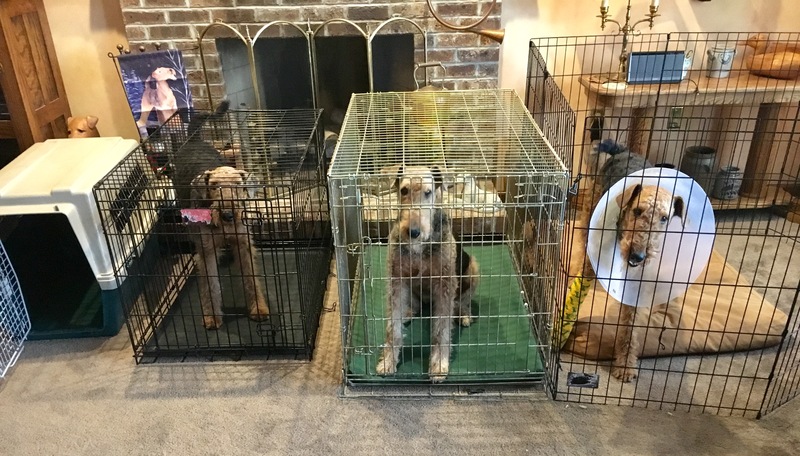 We say it is cookie time and they run in their crates. They usually stay there until the dog sitter comes to rescue them at 11. Today they went in and only stayed until I got back from my appointment. I am home working today to keep an eye on Lindy. If we did not crate them, the place would look like a scene from "Cat in the Hat"
so you trained them to lock themselves up??? That picture is adorable, but it makes me a bit sad at the same time. Maybe it's the cone. You can tell the pecking order in this family by the size of their crates, the comfort and cushiness of their beds. I know Lindy rules but sheesh, let's show a little love for Tillie and Fontleroy. I'm surprised Lindy doesn't have his own ice cream maker in his suite. Lindy now has a raised feeder because it was hard for him to reach the floor. Tillie has a very dense orthopedic mat in her crate. It is a lovely spring green. Ryan has nothing because he has eaten all his beds. Lindy's regular crate is the size of Tillie's. He doesn't fit in it with the cone. Life is equitable at Airedale Estates. 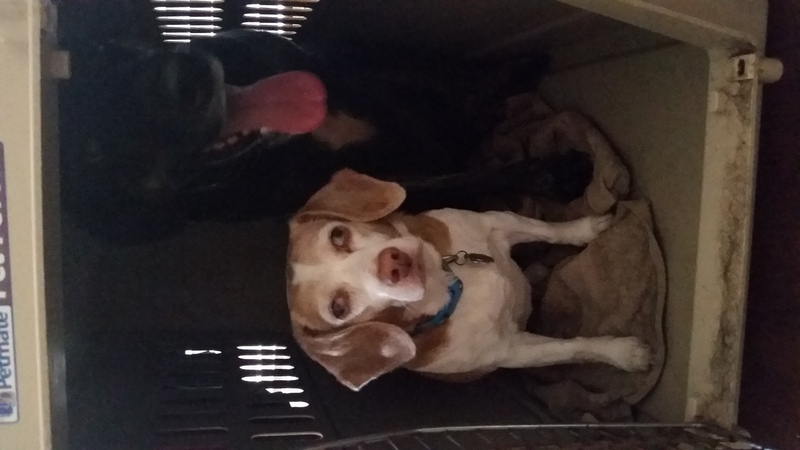 And this is what happens when you tell the dogs to go to their crates, and the beagle wants to be with kray. Sorry for the dark picture, but kray is a dark dog also. Ryan eats his bed because he is curious.